Chhattisgarh Teacher Eligibility Test (CGTET) had been organized on 17 July 2016. This test was conducted by Chhattisgarh Professional Examination Board or CG Vyapam. The exam consists of two papers 1 & 2. Paper 1 (Class I to V) was held in morning session from 09:15 to 11:45 am and paper 2 (Class VI to VIII) was from 02:15 to 4:45 pm. Now CGTET Exam result is declared and can be checked by the candidates who had given this exam. If you have given this exam, then you can check the results of CG TET exam from link given below after declaration. CG Vyapam had conducted this CGTET exam on 17.07.2016. Now the results had been declared by the department on 16.09.2016. 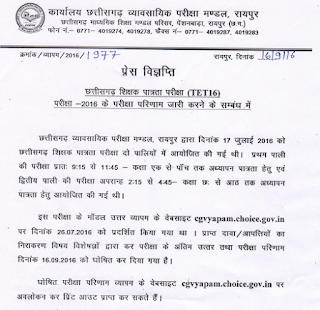 CGPEB had uploaded the results at its website cgvyapam.choice.gov.in as they got prepared. You can check them easily through below link. The online applications for CGTET were started from 11 June and the last date was 22 June 2016. After the application process gets over, the written test was scheduled to be held on 17 July 2016. The CGTET exam consists of objective type questions. Four options are given and one is the correct answer. If wrong answer was given, then is no negative marking. The candidates will be able to download and check their marks obtained / score card after result declaration. 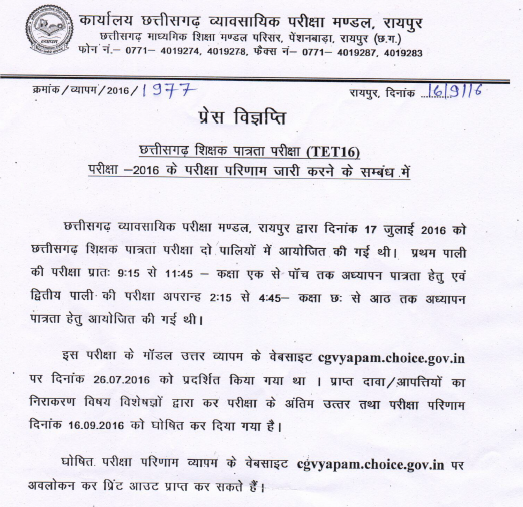 The result of CGTET exam will be uploaded by cgvyapam.choice.gov.in website. The merit list / ranks / cut off marks used or score cards will be available there. We will be providing you latest news and happening regarding this result. You can check CG TET Result marks Score card via the below link.